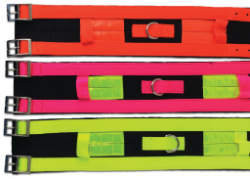 Made of ballistic nylon for ultimate throat and neck protection of pets against hogs and Reflexite. 4" wide x 18", 20", 22", and 24: lengths. Comes in Hot Orange, Hot Pink, and Hot Yellow.